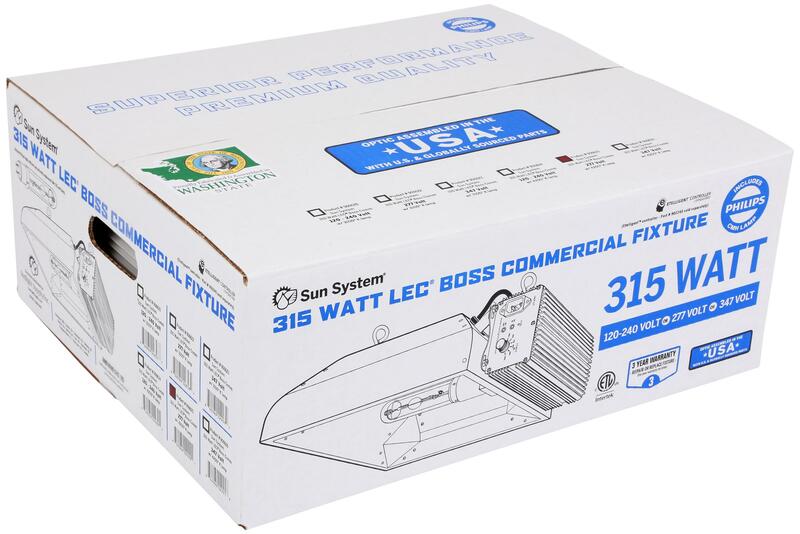 The Sun System® 315 watt LEC® Boss Commercial Fixture combines the cutting edge Light Emitting Ceramic® brand technology with the Sun System® 1 Etelligent™ controllability options (controller sold separately #902245). State-of-the-art 95% reflective German aluminum interior with 98% reflective corner inserts offer unparalleled output, reflectivity and diffusion. 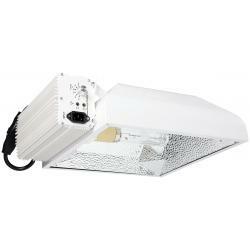 Includes Philips highly efficient agriculturally engineered CDM-T 315 watt lamp. The lamp creates amazing full color light spectrum out of next generation ceramic lamps. 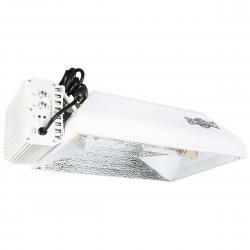 Higher amounts of beneficial UV and far red spectrums increase the lamp's growth power to the plants. 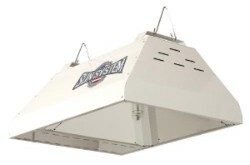 The 3100° K lamp is a very high 1.95 PPF per second light source. 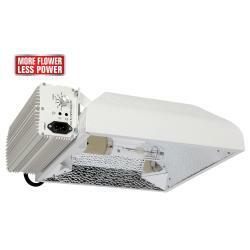 Available in 3100° K or 4200° K color temperature, high 92 CRI, 33,000 initial lumens (105Lm/W). The long life 20,000 hour lamp has an excellent continued performance, 90% lumen maintenance @ 8000 hours and a high, 85%, PPF maintenance @ 20,000 hours. 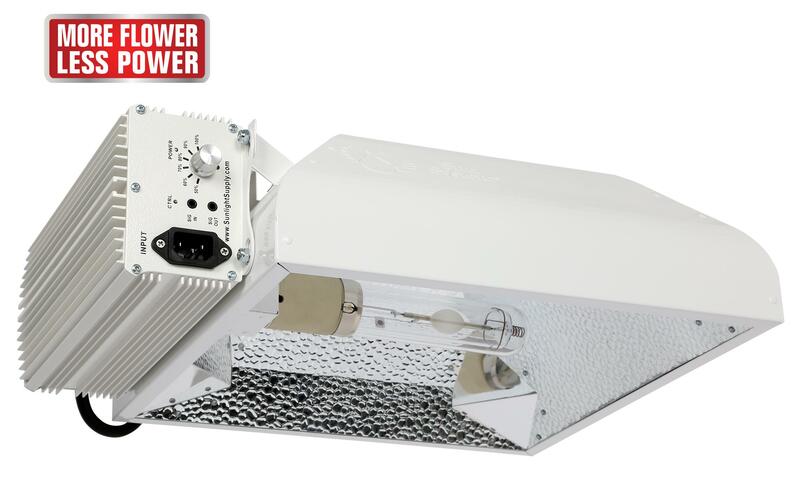 Ballast has a thermally optimized non-fan cooled aluminum housing that is ideal for commercial environments. Operates on 50/60 Hz low frequency, square wave, which makes this electronic ballast highly efficient and designed specifically to drive LEC® lamps at a sustained peak performance. Internal ballast programming will protect unit in instance of open circuit, short circuit, over/under voltage or high temperature exposure. Features internal built-in circuit breaker. This fixture is dimmable which allows for operation of a LEC® lamp at 50%, 60%, 70%, 80%, 90% & 100%. The low current, staggered ignition delay feature eliminates circuit inrush overload and protects lamp for increased lumen maintenance. Features compact commercial warehouse design. Power cord/plug configuration varies by fixture voltage. The 120/240 volt model includes Convertible Smart Volt™ Dual Ferrite power cord with detachable 120 volt and 240 volt plugs. 277 volt features a hard-wired 6 foot 277 volt power cord with a L7-15p twist lock plug. Includes eye bolts.